Vannophat Kaploykeo and Tanchanok Yimsomboon perform at Ben’s Theatre in Pattaya. 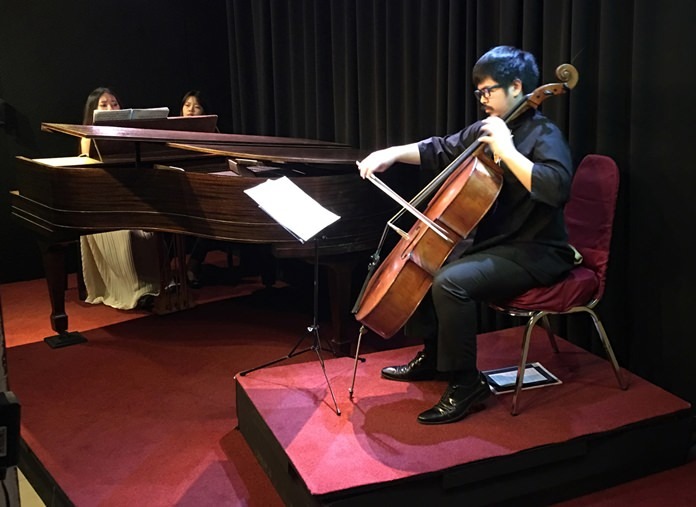 Two talented musicians from Bangkok recently presented an evening of music for cello and piano at Ben’s Theater, Jomtien. The cellist was Vannophat Kaploykeo (Tau) who began cello lessons at the age of ten and is currently a student of Juris Lakutis. He has performed as a soloist with the Mahidol Symphony Orchestra and the Mahidol Pops Orchestra, while also serving as principal cellist with several university and youth orchestras in Thailand. At present he is the principal cellist of the Princess Galyani Vaddhana Youth Orchestra and the Mahidol Philharmonia. The programme opened with the Sonata for Viola de Gamba and Harpsichord in G major (BWV1027) by Johann Sebastian Bach and was followed by Robert Schumann’s dramatic Fantasiestücke for Piano and Cello, composed in 1849. Vannophat then played the well-known work by Ernest Bloch, From Jewish Life, Three Sketches for Cello and Piano which were composed in 1924 and dedicated to Hans Kindler, the principal cellist of the New York Philharmonic. Throughout the concert, Vannophat was accompanied by Tanchanok Yimsomboon who was born in 1997 and started piano lessons at the age of four. She was accepted into the Young Artist Program at the College of Music at Mahidol University and received a merit scholarship in the third year. Currently, Tanchanok is a second year student at the prestigious Fryderyk Chopin University of Music in Warsaw, Poland. After the intermission, Vannophat played Sergei Rachmaninoff’s Vocalise arranged for cello and piano and the concert culminated in the powerful and challenging Sonata for Piano and Cello in E minor, Op. 38 by Johannes Brahms. I was told that there was a mild panic an hour before the concert started, because the pianist, seated behind the grand piano couldn’t make eye contact with the cellist – an essential part of ensemble playing. The result was that in the remaining sixty minutes before the concert, Ben and his assistants had to build an additional rostrum for the cellist, shown in the photo. By all accounts, it was well worth the effort.